Pack-horse bridge at Wycoller, Lancashire. OS grid reference: SD 932383 39247. 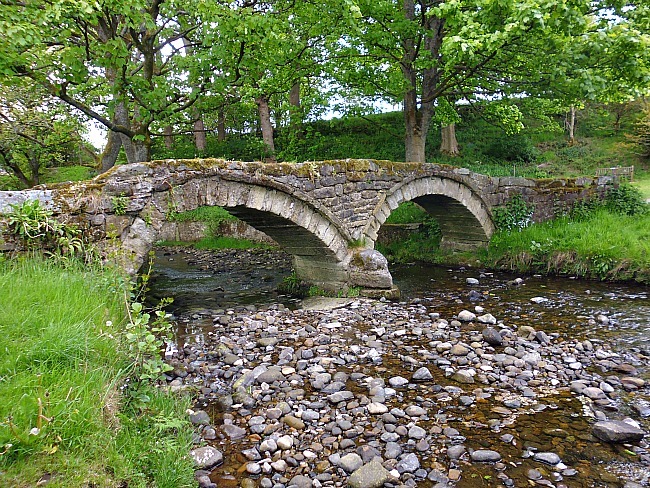 The secluded little village of Wycoller nestles in a narrow valley 1½ miles to the east of Trawden, Lancashire, but it is well-known for its three ancient bridges which have stood over the beck for hundreds, if not thousands of years. They have even outlived Wycoller Hall which stands ruined and desolate. But each of the bridges has its very own tale to tell. There are actually seven bridges in the village but the pack-horse, clapper and clam bridges are of historic interest because of “their” great ages. Wycoller is easily reached on country lanes from Trawden. Park up at the large carpark ½ a mile to the west and walk into the village along the footpath at the side of the lane. There is a small carpark for disabled people close to the café. The pack-horse bridge, Wycoller, Lancashire. 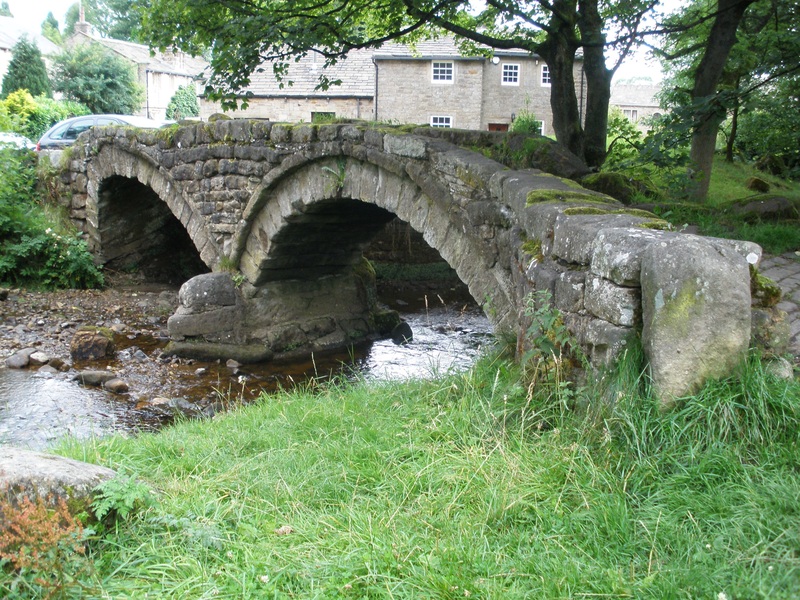 The famous pack-horse bridge is a two-arched structure spanning Wycoller beck. It is sometimes called Sally’s Bridge after one of the Cunliffe family who lived in the hall opposite the bridge in the 18th century. Historians have argued about its age, but none of them are certain, but it is thought to either date from the 13th century or the 15th. Its construction is a bit of an oddity, in that the arches are not equal to each other and the structure’s base-stone boulders are not level, giving the bridge a somewhat precarious appearance because of that – author John Bentley in his fascinating book ‘Portrait of Wycoller’, alludes to this. The coping stones along the sides of the bridge are significant in that some of them have faint cup-marks in them, indicating that they were brought down from a prehistoric site on the moors above Wycoller and used in the bridge’s construction. When walking over the bridge ‘you need’ to take care owing to the smoothness of the paving slabs which have endured hundreds of years of use. The Clapper Bridge at Wycoller, Lancashire. 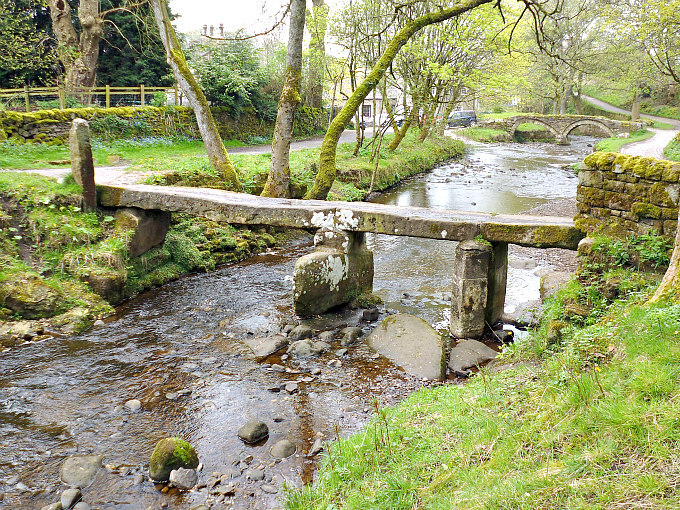 Clapper bridge, sometimes called the Druids’ Bridge, Weavers’ Bridge or the Hall Bridge, is just a short distance along the beck. This is a primitive structure but of massive proportions consisting of three flat gritstone slabs resting on two stone piers, one being a round-shaped boulder, the other a thinner pillar-shaped stone that looks quite fragile, but it is in fact very strong. It was originally a two-slab bridge sup-ported on one central pier. However the bridge has succumbed to floods over the years and has had to be reconstructed a few times. Its three slabs are heavily worn by hundreds of years of use. There is a legend that says this bridge led to a grove where druids practiced their strange rituals; there is no sign of this mystical grove or amphitheatre today, and the handloom weavers of Wycoller have long-since hung up their clogs! The clapper bridge is thought to date from the 16th-17th century, though a few historians ‘think’ it might date from before the Norman conquest (Bentley, John, 1993). The Clam bridge, Wycoller, Lancashire. And the third bridge, the clam bridge, is located ¼ of a mile along the track that runs beside the beck in Wycoller Dene. This ancient bridge is formed by one single gritstone slab which is some 12 feet long. It rests at one end on the bank, while on the other side it is propped up on some large stones, but it is very secure even though it might look like it is about to fall into the beck. At one time there was a wooden safety rail at one side and the holes for this can still be seen. The clam bridge is ‘often’ said to date from the Bronze or Iron Age and to have originally stoop up-right on the moors to the north east (as a standing stone – menhir), but there again it probably only dates from the 15th or 16th century. The long slender slab is well-worn and great care should be taken when crossing it. In the floods of 1989-90 the clam bridge was brought crashing down. It has sometimes been mistaken for a tree trunk lying across the beck and at a distance it does indeed look like that. Bentley, John., Portrait of Wycoller, Wycoller Country Park Project, Nelson, 1993. Categories: Ancient Bridge, Misc Subjects | Tags: The Three Ancient Bridges at Wycoller in Lancashire | Permalink. 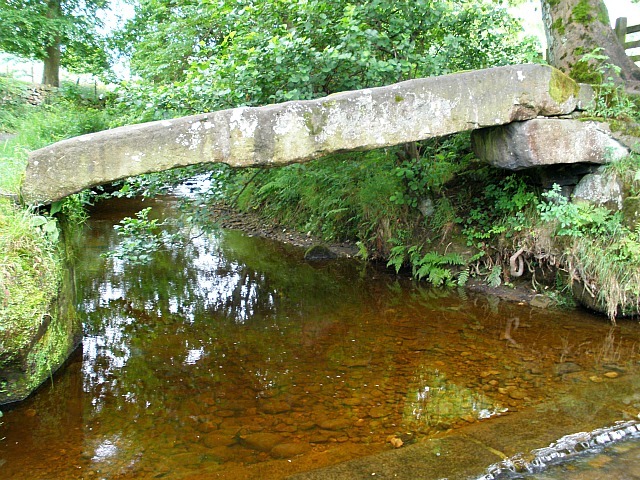 I have visited Wycoller Country Park many times, and seen all three unusual bridges. It was interesting to read this explanation about their construction and the theories and legends which surround their origins. The ruined Wycoller Hall on the other side of the Pack Horse Bridge is thought to be the inspiration for Ferndean Manor in Charlotte Bronte’s ‘Jane Eyre’. It is a shame that the Park is now threatened with closure over funding cuts. Though the Lancashire County Council who own the Park say they are looking for new ways of managing the Country Estates. This is laudable in the present austerity climate but what happens if no ways are found which continue proper management, security and maintenance. The Hall and its environs have been the subject of vandalism in the past.